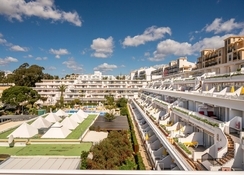 Muthu Clube Praia da Oura is located in central Albufeira, on the southern coast of Portugal, a few steps from the beach. 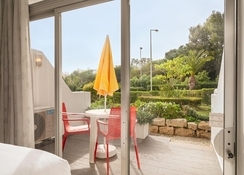 The Muthu Clube Praia da Oura offers 531 well equipped guestrooms that come with a kitchen, fridge, microwave, complete bathroom and a balcony. A television with satellite channels and Wi-Fi internet are installed in each room. Amenities in the rooms include a sofa bed, safe as well as baby cots if the need arises. The natural environment that surrounds Muthu Clube Praia da Oura gives the area a magical atmosphere where outdoor fun becomes essential. The hotel features a swanky nightclub, an inviting swimming pool and a tennis court. There’s also a souvenir shop and a kiosk. The shuttle service offered by the hotel takes guests anywhere within a 3km radius. The onsite restaurants and bars serve a variety of cuisines and beverages from around the world. 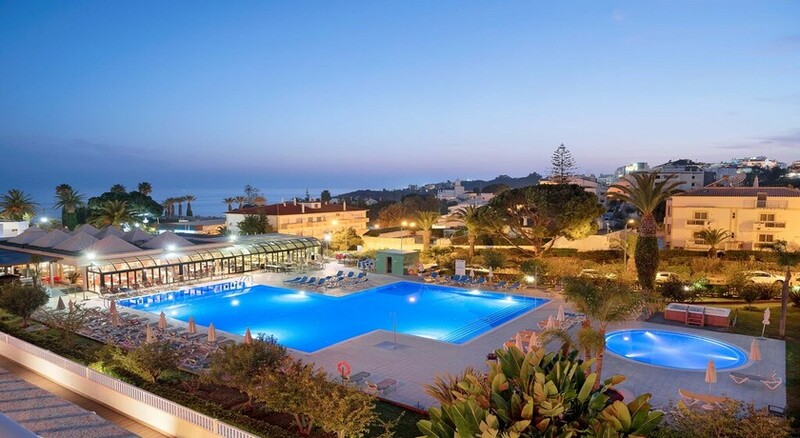 Muthu Clube Praia da Oura is located next to Praia da Oura. 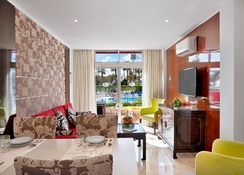 The hotel is in within walking distance from the Santa Eulalia Beach and Aveiros Beach. The Faro Airport is about 40km from the hotel. The property is also close to the city’s bullring. With over 500 guestrooms, Muthu Clube Praia da Oura offers its guests comfort similar to their own home. The rooms come equipped with air-conditioning, a fully functional kitchen, Wi-Fi internet, cable TV and bathroom. Jac’s restaurant is the main restaurant in the hotel, serving English and continental buffets. There are five bars at the hotel: The Piano Bar, M&M bar, the Ocean Bar, the Beer Garden and the CPO pool bar. There are several restaurants around the hotel which can be reached within a short distance. The Muthu Clube Praia da Oura offers free shuttle service to any location within a three kilometre radius from the hotel to its guests. The hotel complex boasts of an outdoor pool, a lounge, a nightclub and a tennis court. The Oura Beach is only a few hundred metres from the property. At the beach, you can enjoy various water-sports. Nice hotel and great location, nice restaurants around and a short tuk tuk ride into town with lots more things to do! Quiet few days in January but the weather was a lovely pleasing 19 degrees. the food was plentiful and good but considering its marketed as an all inclusive hotel/package, you only find out when you get here that wine is NOT included, not even local never mind international, actually spoiled the holiday.